You never know until you actually know, but this could be our very first glimpse at Apple’s 2016 flagship iPhone 7 Plus. 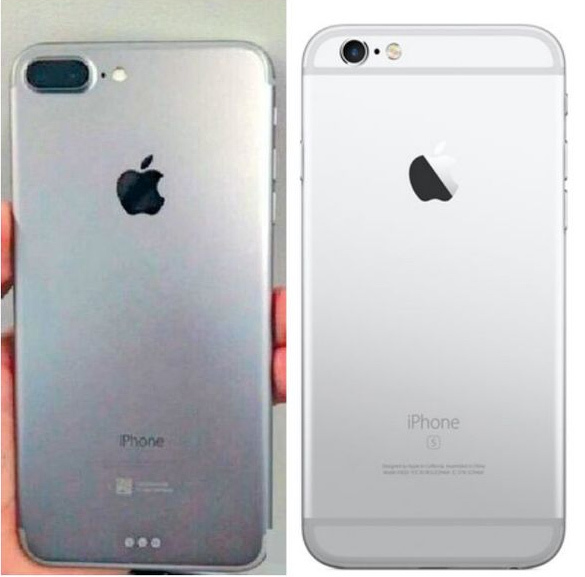 There’s no real way of determining if this is an official prototype of the iPhone 7 Plus that has rolled out of the assembly line in China, but regardless of its validity, it raises interesting questions about the potential design of the new iPhone and gives us a look at the new and improved dual-camera system that could ship with the hardware later this year. 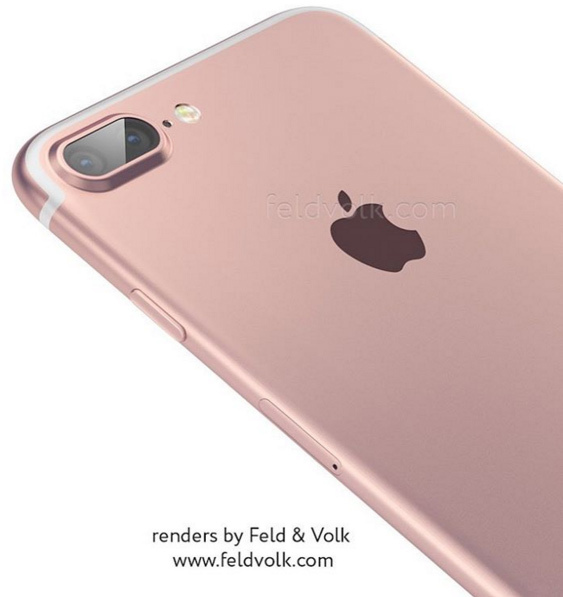 The overall shape of the hardware resembles the current form-factor of the iPhone 6s Plus in terms of its dimensions and curved edges. It is however immediately notable that the device shown in this leaked image will come with a substantially different camera setup than what we currently have with the iPhone 6s and iPhone 6s Plus. The larger pill-shaped aperture, which protrudes from the back of the device, has clearly been extended to play home to the highly speculated dual-lens camera system that we’ve heard so much about. There has been a great deal of speculation over the last few weeks about whether or not Apple will use a dual-camera system as a differentiating factor with the available iPhone 7 models. Some sources have suggested that the iPhone 7 Plus will stand above its smaller non-plus brother as the more premium of the two models thanks to this innovative camera solution. Some have suggested that both models will benefit from the upgrade, whereas some analysts believe Apple simply isn’t in a position to integrate that type of camera tech into a mobile device just yet. This leak is informative in the fact that it suggests at least one of the models will ship with dual camera lenses. If you look closely, you will also notice three small dots that are located at the bottom rear of the shown device. The leaked photo itself isn’t the greatest quality, but it’s very likely that this could be the presence of a Smart Connector port that would allow the iPhone 7 Plus – and perhaps iPhone 7 as well – to be used with a range of new and innovative accessories. This type of connectivity first made an appearance with the release of the 12.9-inch iPad Pro last year. Photo: iPhone 7 Plus with dual-lens camera, smart connector, no antenna bands on left, iPhone 6s Plus on right. The leaked photo however does not show us the bottom end of the phone, leaving us to continue speculating on the fate of the 3.5mm headphone jack and the arrival of a dual-speaker setup, but it does pack the cleaner redesigned antenna lines that has been speculated for a while now. An interesting concluding note by the source suggests that Apple is also looking to increase the storage capacity of the upcoming phones from 128GB to a whopping 256GB. 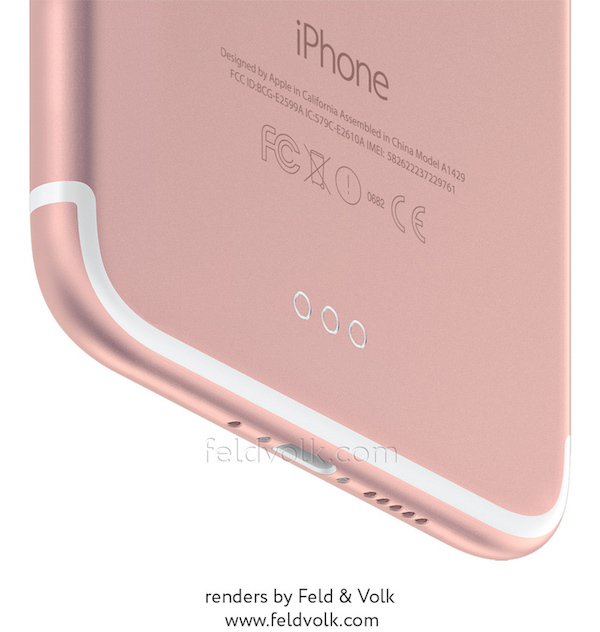 Building on the new leak, iPhone customizers Feld & Volk have also released a render of the iPhone 7 Plus, carrying the elements seen in the leaked photo. We would definitely like to see a few more leaks of this nature to provide some kind of legitimacy to the leaked photo before we take it as gospel, but for now, it’s a great start to get a feel of what could possibly come with the iPhone 7 and iPhone 7 Plus. Is it just me or it Looks ugly! The camera bit reminds me of the LG G5, and strangely, Bender from Futurama..
Why would they need the circles for wireless charging? The Samsungs that already charge wirelessly don’t have them. It look like a binocular. I love my 6s! I was referring to the Camera bit in specific. Since Steve Jobs left, Apple stopped innovating. Tim Cook is just a crooked politician, not a visionary. i share your view 🙂 since iphone 6, i think the design became ugly but i have yet to see review sites mention that. i dont think they’re saying that it’s beautiful either—because imho it isn’t. No smartphone today has wireless charging. All are wired charging as it doesn’t matter whether the smartphone is wired or put on wired pad. Apple’s wireless charging will the the first with OTA charging. Image stabilisation and better zoom quality etc as well as dual camera on split screen one recording whilst other can zoom in etc…..if they could get it to record in 3D would be great but dont see it happening! but how can you use it for image stabilization/sharper images ? if one only takes small crop of the other one ? Yes hon, the Samsung charges wirelessly. The pad may be connected to a wire, but not the phone. And IF apple comes out with OTA charging, guess what? It’ll draw from WIRES in the wall, so by your standards, still not wireless. But then you were just being ridiculous, so it doesn’t matter. Lighten up, would ya? I like apple product not because of steve jobs and how innovative he is or how dumb trim crooked is. apple is very fast, the macbook alone is 100 time way faster than lagging windows. iPhones are way too fast to compare to an android. more user friendly and to be honest easier to use, with simplicity and all that. apple started this whole technology thing and they will end us all with some robot they create to wipe human race…. i cannot wait. From what I’ve read, one will take black and white photos using a different sensor, which allows it to collect more light and more detail than a color sensor, and then both photos are merged in software to create the final color picture which is of better quality than one created using just a color sensor. As well as some of the other possibilities others have commented on here. 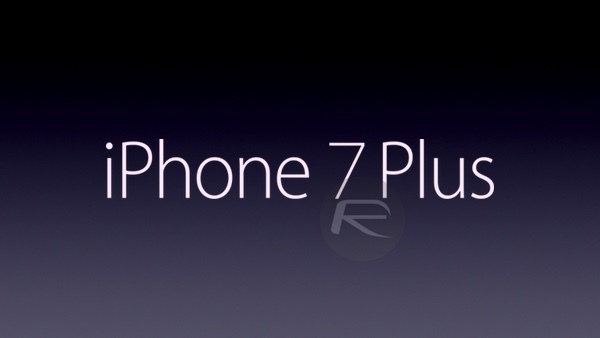 iphones also run ios, which is limited in scope. run android on apple hardware and you’ll see the truest definition of lag!